Just yesterday, I woke for the second time in as many days having dreamed about honey bees swarms and honey comb. Last Thursday mornings dream was a doozey that involved a lengthy visual cascades of honey comb imagery and laborious representations of my participation in removing many hives from the walls of several houses and buildings. This dream seemed to go on for quite some time as if I was engaged in this labor of activity for several days. I woke feeling quite exhausted. Inadvertently that morning, I found myself in the office of my part time employer explaining to him why I was so tired. The subject of the dream came up and I shared with him the basic outline. The for some flippant reason I related how in the past when I dream about, “The Ladies” as I call them, something relating to my own hives or feral swarms comes up. True to form, two days later on the evening of a big wedding here at the resort, I received a call from a woman asking if I am available to deal with a swarm of honey bees that had landed 45 feet up in her pine tree. The video link of me capturing this swarm is provided here. I have been beekeeping for six years now. I have performed dozens of hive removals and an equal if not greater number of swarm captures. For those that don’t know. An average swarm is a group of about 1500 to 15,000 honey bees sometimes more. A swarm is a free moving mass of bees that is leaving an old or damaged hive to establish a new hive in another location. Swarming is most often done so that a hive can reproduce a new hive. It is natural essential and usually harmless. A hive is the wax structure that the bees create inside a cavity of some sort where the bees live reproduce and store honey. The bees are the swarm. The hive is the home. Honey bees have this tendency to like the cavities in houses and old buildings where the conditions are more stable than in a wild environment. 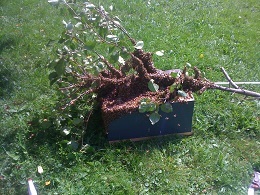 Removing a hive is a messy and complicated endeavor. And on a hot day with a full bee suit and 40,000 plus irritated bees it is quite exhausting. However I live for it. Beekeeping and the preservation and protection of these beings is my passion. As some of you know, so is the Art of Shamanism. I may not be the most skilled shaman or the best trained, but I am quite open intuitionally and my passion for honey bees and my intuition have proven themselves over the years, to be quite intertwined. On Tuesday morning I once again dreamed about bees. Knowing full well at this point to keep my eyes open, I decided that I needed to go check my bee yard, “Apiary”. I got there and nothing was going on. The bees I captured the day before where safely ensconced in the dark cool barn out of the heat from the sun. I wanted them to acclimate and accept the frames of honey comb I had provided them as their new home. This can take anywhere from 24 to 76 hours of imprisonment with no way of getting out otherwise in their angered state they would take off and all fly away. They took under 48. It was working into a rather sunny day in Cabot Vermont. I decided after 48 hours I could pull the swarm in the modified trash can out into the bee yard and test them to see how they reacted to full sunlight and an open door policy. I removed the imprisoning wire mesh and duct tape. Once warmed up they began to pour out of the hastily cut hole in the trash can lid, but after an hour they hadn’t shown signs of swarming. I left them for an hour or so to go get lunch and some cool water. All suited up when I came back, I saw from the distance a dark mass on the willow bushes near the electric bear fence. There was a sizable swarm on the trunk of the bush. Flustered I rushed to check it out not relishing the idea of trying to catch this swam again. It turns out on closer inspection, the trash can swarm was still at home in the can, busy as ever. Once again my instinct had panned out, this new swarm was from one of my previous hives. Had I not listened to inner guidance I would likely never had caught this swarm by not showing up that day. You can see swarm number 2 in the previous video link. It took me some time to coax the bees into the nuc box I provided for them. Eventually I found the queen and trapped her inside with several hundred worker bees. Being pressed a bit for time, I decided that since I had the queen I could shake the branch and disrupt the swarm cluster. The swarm kept wanting to re-cluster on the tree, I had to do this several times before they finally homed in on the queen bee’s pheromones that emanated from the nuc box. Since I was a child I have been fascinated with insects, ants and butterflies in particular. I sat back and delightedly watched the behavior of these amazing beings. Spiraling around, they circled the yard searching for the chemical scents of the queen in the air. I let my eyes relax and allowed my vision to become fuzzy. Tom Brown Jr, the great wilderness survival teacher, calls this, “Looking at the world with soft eyes”. I had discovered this technique as a child watching carpenter ants on a pile of mulch. With soft eyes I could see the collective movement of each ant and how it relates and is synchronized with the mind of the whole colony. It fosterers an extremely relaxed state of mind that is almost hypnotic. I moved into soft eye as I watched the swarm swirled around the yard. I was mesmerized. The perfection and intelligence of these creatures was so moving and magnificently touching. My heart opened and I could do nothing but weep. It was truly a sublime and beautiful moment of teaching. The bees know their nature. They don’t fight it. They are perfectly in harmony with the earth. Maybe someday we humans can return to being as in tune with our true nature, “not this artificial manipulation” as they are with theirs.